I saw on Cleveland.com today something I had missed earlier this year - a proposal to close Burke Lakefront Airport (PDF) in order to use it for a new port by the Cleveland Port Authority. While I'm not sure I agree with using it as a port, I certainly agree that the airport has to go. Particularly since I've been to Chicago and seen what their lakefront is like. Burke is an eyesore, useless except for the very rich, and an unbelievable waste of lakefront property. A vast stretch of lakefront property in Chicago is a park, Millenium Park I think it's called. So while we visited on a snowy day in December and there weren't that many people using the park, I can imagine it being absolutely packed during the summer. 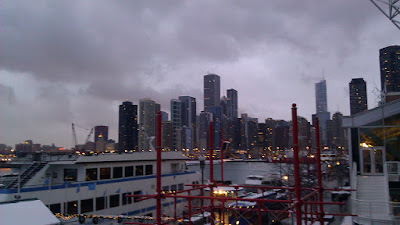 Of course, Chicago also has the Navy Pier from which the above photo was taken and they have an absolute gorgeous skyline. With current trends in Cleveland, we won't be able to match that but we can certainly do better than what we have right now with Burke Lakefront Airport ruining access to the lake. Which reminds me of the conversation we had on Christmas Eve over dinner. Mom, who is very active in the community and in helping create a "Welcome Center" for immigrants had also invited over a friend, Harry Weller, who has been active on the Welcome Center for quite a while - at least until the Jewish Federation took the project over - or rather stepped up to funding it. So invariably the discussion turned to the progress of the Welcome Center and Cleveland in particular. As we all know, Cleveland is in trouble. To be blunt, its a ghost town. You have to remember that I lived for 9 years in Tokyo which is one of the most populous cities in the world so you may think I'm a little skewed. And your probably correct. However, I also lived in Okinawa, the least populous prefecture in Japan. Naha, the capital of Okinawa has a population of something like 300,000 (probably closer to 700,000 if you defined Naha as a region with it's surrounding cities like we do to make ourselves feel better about our region). It's a roaring metropolis compared to Cleveland largely due to the fact that it is in a very condensed space(15 square miles compared to Cleveland's 82 square miles(source Wikipedia)). So yes, I may be skewed a little bit in my view, but I still maintain that Cleveland is a ghost town. And that is not a good thing. And I only see more trouble on the Horizon. Continental/United will pull out of Cleveland, there is no doubt in my mind. American Greetings is looking at relocating their Brooklyn location, possibly to Chicago. UH and the Cleveland Clinic have started to build outside of Cleveland proper or at least outside of "downtown" - liberally defined to include University Circle area. Most of our major corporations no longer are downtown an Eaton Corporation is moving to an area along 480 as well. Harry indicated that the primary focus of the Welcome Center will be luring staff for the hospitals, the Clinic is in fact supposedly laying off people. Harry also pointed out that the Hospitals are non-profits and building an economy around non-profits is not a really good economic development plan. His view is that we need to focus on for-profit businesses that generate jobs, and investment opportunities. I certainly understand Harry's point of view and must admit that I'm overwhelmed with the sheer volume of non-profits in Cleveland. How much money in this region is going into activities that while the may make the community better is certainly not creating a vibrant economy since it's all base on donations. And as the Clinic and Continental have made clear, that's not viable in the long run. So we absolutely need to be looking to develop business; non-profits will benefit greater through a vibrant economy that's making money than to continue to fight over a dwindling supply of money because businesses are moving out. On the other hand, I actually think it's pretty smart to focus on an area where we have some leadership and/or global recognition. So focusing on healthcare makes a lot of sense to me. In that vein, the Med Mart/Convention Center makes a lot of sense to me as well, though I have my reservations. I also like the fact that we have a Casino in the works (though in general I think that if your Economic Development plans rely on a Casino you don't have an economic development plan - Casinos don't produce anything). and the East side Flats project seems to be back on track. And in particularly, I think the re-emergence of University Circle lead by the likes of Chris Ronayne, Lev Gonick and less visible players like Marc Cantor is tremendous. There's certainly a lot of good things going on in this town but for some reason it all seems so ineffective. A term I learned in Japan is 空洞化, or hollowing-out. In English, it means deindustrialization. We all know Cleveland has been facing it for years. Whether through competition to better manufacturers (Japanese car manufacturers), to non-labor union regions of the country or overseas, China specifically. This concept is not some ungraspable zen thing, we all know and have faced it for years. What I find interesting is that the Japanese also have a concept of "Donutization" (ドーナツ化現象) which is basically what we call sprawl. But the important piece of it donutization is the empty center. In our concept of sprawl there may be an unexpressed assumption of an empty center, but it's not inherent in the term. The Japanese term expresses it very clearly. The concept is much like our sprawl concept where as people are looking for a better standard of life they are moving away from the city to locations where they can afford to have a nice house an yard, etc. 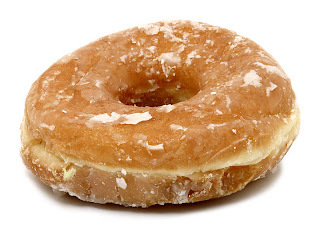 So, what Cleveland is facing is both deindsutrialization, at least in our perspective having been a global manufacturing powerhouse, and a donutization. And unless our economic development plans address these two forces, we will recover they way I think most of us want which is to see Cleveland(and Akron/Canton and Youngstown) thrive. In many ways its just physics. We need a center of gravity to counteract these centrifugal forces. We need something massive and dense enough to keep people from moving farther and farther out, and out of the region completely. So while planning regionally is fine in concept, it's only fine in concept if the region accepts that we need to rebuild the center of our cities. And to start, we need to try and stop the big guys from moving out to Beachwood, Westlake, Solon and other suburbs. We need them to be located in Cleveland. We need it so that people are just there for the events and then leave. We need their employees downtown 8 hours a day, and moving towards being there 24 hours a day. We need to dispel the perception that Cleveland is a ghost town. What I'm not seeing in the efforts is the plan that links them to each other in order to create that center of gravity. I have more thoughts on the process of and creating a center of gravity, but that's for a separate post. For now, I'm done babbling.